I received an email from my kid’s high school administration this past Wednesday. The message advised me that many of the students participated in a 17-minute walk-out as part of the nation-wide event to remember and support the 17 faculty and kids who were killed in the Parkland, Fl school shooting. The message further informed me that the kids who participated enjoyed the full support of the school administration in exercising their First Amendment rights and would not be penalized in anyway. All well and good, as far as it goes. School is a highly appropriate venue for kids to learn about their rights; and the curriculum should be flexible enough to incorporate current events when they provide salient learning moments. Worse, the moment on Wednesday was billed locally as a lesson on practicing First Amendment rights and/or solidarity for the Parkland victims, families, and friends, but the ultimate aim of the organizers of the nation-wide event was further curtailment of Second Amendment rights. If you’ll recall, there have been several mass shootings/mass murders during previous administrations, including several at schools, but no group saw fit to so dramatically use the nation’s school children as puppets to protest for more gun control during that span of time. This time around, the shooting happened during a Republican administration in a county led by a sheriff that was a strong supporter of Hillary Clinton for President, and a strong supporter of the Democrat Party. The sheriff and school district participated in an Obama Administration initiative designed to end the so-called “school to prison” pipeline. The initiative boils down to not arresting or prosecuting non-white school-age kids who violate the law, in order to keep them in school and show how tolerant and non-discriminatory the community is. The policy failed spectacularly. There was something on the order of 66 missed opportunities to keep the Parkland shooter from his appointment with infamy over the course of his high school career. But even with all of those chances, the future killer couldn’t make it to graduation. He was expelled. Fast-forward to valentine’s Day, 2018. When the shooting was in-progress, as many as four Broward County Sheriff’s Deputies felt no compunction to enter the school and attempt to stop the 19 year-old gunman. When it was all over, the killer was arrested. So even though he was given every chance, he will still end up going to prison (or the looney-bin)- straight from the scene of the 17 murders he committed in the school he was expelled from. Did that come up in classroom conversations across the country before or after the Wednesday walk-out? No? The organizers of the walkout would have us believe that the Parkland massacre was caused by the NRA and the AR-15. Their solution is more gun control. But Marjory Stoneman Douglas High School was already under the most restrictive gun-control regime possible: It was a gun-free zone. It said so right on the label. On the other hand, the community was not a lunatic-free zone, and I’m not just referring to the shooter. 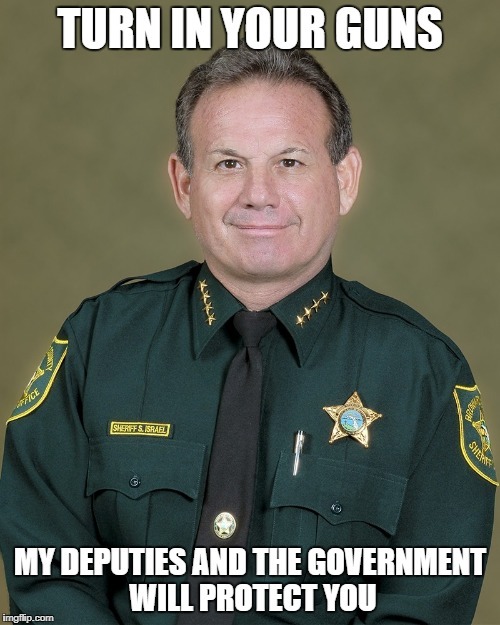 17 people were shot by the killer, and they were sacrificed on the alter of leftism as a consequence of virtue signaling by the lunatic leftist sheriff and the lunatic school board of Broward County, Florida. Strict policies on removing dangerous kids.